Since Mr. Ritt’s pulled up stakes in Philadelphia several years ago, the city had been without a dedicated gluten-free bakery. 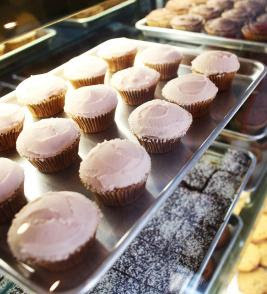 The just-opened Sweet Freedom Bakery (1424 South Street, 215-545-1899) not only fills that void, but also hopes to satisfy the cravings of vegans and customers with other food restrictions. The pâtisserie is owned by Alison Lubert and Heather Esposito, both of whom are certified holistic health counselors. All of their products are also free of dairy, corn, eggs, peanuts, soy and casein. Each item’s ingredients are listed on a prominently placed tag found in front of each tray of sweets. Lubert and Esposito bake with a variety of flours (brown and white rice, sorghum, garbanzo bean/chickpea and fava bean) and sweeten their treats with low-glycemic agave nectar, maple syrup and coconut sugar rather than with refined or artificial sweeteners. Available every day are assorted cupcakes, cookies, muffins, cake slices and two specialty items: a Magic Bar and a Blueberry Oat Crumble. Brownies, blondies, macaroons, thumbprints and other cookies and cupcakes appear weekly on designated days. 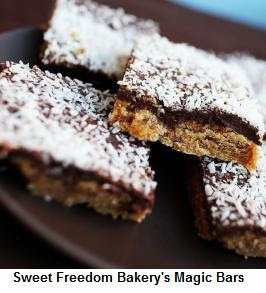 Everyone in my house loved the Magic Bar ($2.75 single/$30.25 dozen), with a graham cracker-like base under a layer of chocolate and topped with coconut shavings. My older son loved the coconut macaroons ($1 single/$11 dozen). I’d venture to say that the healthiest item on the menu is the Blueberry Oat Crumble ($3 single square/$33 dozen), studded with whole blueberries and coated with whole oats. Only the vanilla-frosted Vanilla Cupcake ($3.50 single/$38.50 dozen) seemed to be missing the richness prevalent in the other pastries. Among my favorites were the Chocolate Chip Cookie Sandwich ($3.50 single/$38.50 dozen) and the Banana Chocolate Chip Cupcake, both with chocolate frosting, and the Cinnamon Sugar cake slice ($3.25 single slice/$26 whole loaf). The airy, pastel-hued bakery, open from 10 a.m. to 7 p.m. Tuesday through Saturday and 10 a.m. to 4 p.m. Sunday, has ample room for customers to sit and enjoy a sweet treat with a selection of teas, La Colombe coffee or VitaCoco water. Special-order double-layer round cakes in several sizes and a 12” chocolate chip cookie cake are available with 48 hours’ notice.